NASA's Cassini spacecraft has detected a very tenuous atmosphere known as an exosphere, infused with oxygen and carbon dioxide around Saturn's icy moon Rhea. This is the first time a spacecraft has directly captured molecules of an oxygen atmosphere – albeit a very thin one -- at a world other than Earth. The oxygen appears to arise when Saturn's magnetic field rotates over Rhea. Energetic particles trapped in the planet's magnetic field pepper the moon’s water-ice surface. They cause chemical reactions that decompose the surface and release oxygen. The source of the carbon dioxide is less certain. Oxygen at Rhea's surface is estimated to be about 5 trillion times less dense than what we have at Earth. But the new results show that surface decomposition could contribute abundant molecules of oxygen, leading to surface densities roughly 100 times greater than the exospheres of either Earth's moon or Mercury. The formation of oxygen and carbon dioxide could possibly drive complex chemistry on the surfaces of many icy bodies in the universe. "The new results suggest that active, complex chemistry involving oxygen may be quite common throughout the solar system and even our universe," said lead author Ben Teolis, a Cassini team scientist based at Southwest Research Institute in San Antonio. "Such chemistry could be a prerequisite for life. All evidence from Cassini indicates that Rhea is too cold and devoid of the liquid water necessary for life as we know it." 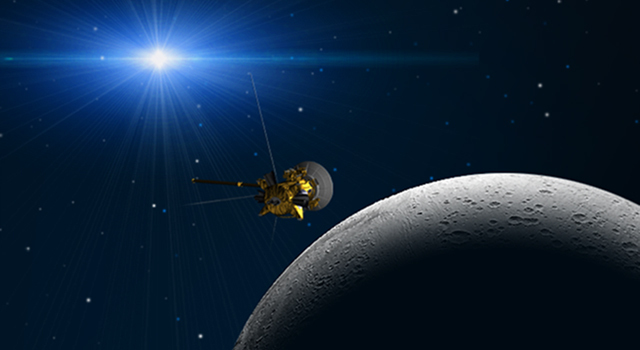 Releasing oxygen through surface irradiation could help generate conditions favorable for life at an icy body other than Rhea that has liquid water under the surface, Teolis said. If the oxygen and carbon dioxide from the surface could somehow get transported down to a sub-surface ocean, that would provide a much more hospitable environment for more complex compounds and life to form. Scientists are keen to investigate whether life on icy moons with an ocean is possible, though they have not yet detected it. The tenuous atmosphere with oxygen and carbon dioxide makes Rhea, Saturn's second largest moon, unique in the Saturnian system. 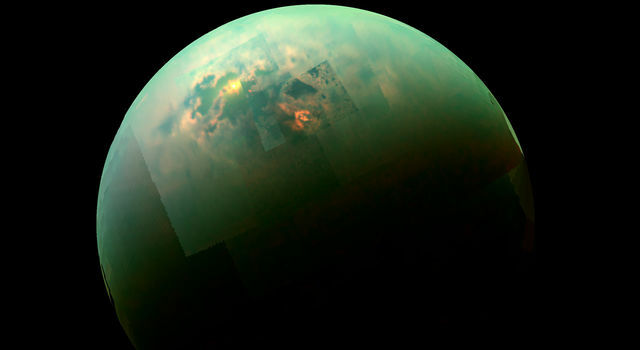 Titan has a thick nitrogen-methane atmosphere, but very little carbon dioxide and oxygen. "Rhea is turning out to be much more interesting than we had imagined," said Linda Spilker, Cassini project scientist at NASA's Jet Propulsion Laboratory, Pasadena, Calif. "The Cassini finding highlights the rich diversity of Saturn’s moons and gives us clues on how they formed and evolved." Scientists had suspected Rhea could have a thin atmosphere with oxygen and carbon dioxide, based on remote observations of Jupiter's icy moons by NASA's Galileo spacecraft and Hubble Space Telescope. Other Cassini observations detected oxygen escaping from icy Saturn ring particles after ultraviolet bombardment. But Cassini was able to detect oxygen and carbon dioxide in the exosphere directly because of how close it flew to Rhea – 101 kilometers, or 63 miles – and its special suite of instruments. 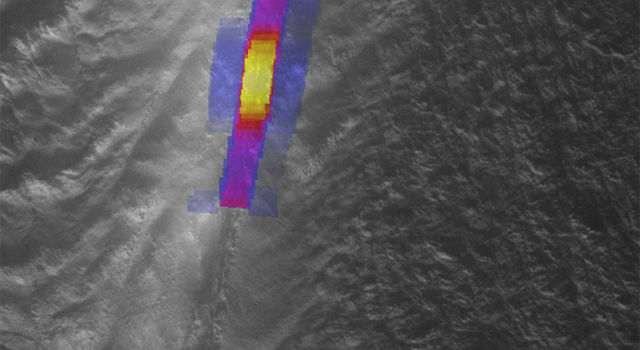 In the new study, scientists combined data from Cassini's ion and neutral mass spectrometer and the Cassini plasma spectrometer during flybys on Nov. 26, 2005, Aug. 30, 2007, and March 2, 2010. The ion and neutral mass spectrometer "tasted" peak densities of oxygen of around 50 billion molecules per cubic meter (1 billion molecules per cubic foot). It detected peak densities of carbon dioxide of around 20 billion molecules per cubic meter (about 600 million molecules per cubic foot). The plasma spectrometer saw clear signatures of flowing streams of positive and negative ions, with masses that corresponded to ions of oxygen and carbon dioxide. "How exactly the carbon dioxide is released is still a puzzle," said co-author Geraint Jones, a Cassini team scientist based at University College London in the U.K. "But with Cassini's diverse suite of instruments observing Rhea from afar, as well as sniffing the gas surrounding it, we hope to solve the puzzle." The carbon dioxide may be the result of “dry ice” trapped from the primordial solar nebula, as is the case with comets, or it may be due to similar irradiation processes operating on the organic molecules trapped in the water ice of Rhea. The carbon dioxide could also come from carbon-rich materials deposited by tiny meteors that bombarded Rhea's surface. The Cassini-Huygens mission is a cooperative project of NASA, the European Space Agency, and the Italian Space Agency. NASA's Jet Propulsion Laboratory, Pasadena, Calif., a division of the California Institute of Technology in Pasadena, manages the mission for NASA's Science Mission Directorate, Washington, D.C. The Cassini orbiter was designed, developed and assembled at JPL. The ion and neutral mass spectrometer team and the Cassini plasma spectrometer team are based at Southwest Research Institute, San Antonio.